Everyone has heard the hype surrounding paintball mega games but why are big games so special? At big games players get much more than just a day of trigger squeezing. 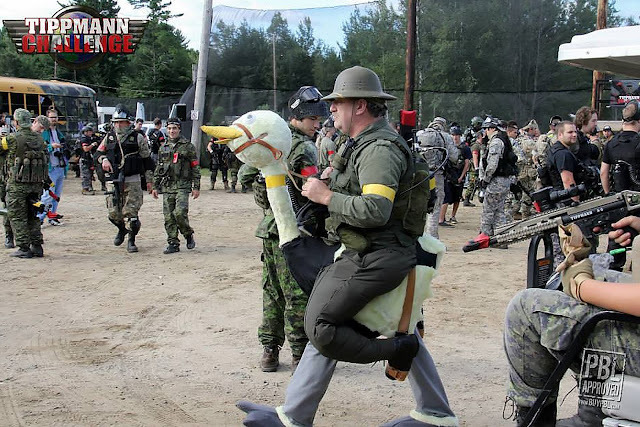 At a big game you get not only a target rich environment but you get to see things like Darth Vader, Ironman, Sarge from Halo, and a jungle explorer riding an ostrich. Tippmann X7 Phenom Atlantic Tactical Woodsball League Event 2 played on August 3, 2012 was some of the most exciting woodsball played in the history of the league. Tippmann Sports and BuyPBL invaded Hypersportz Paintball in Mount Uniacke, Nova Scotia, to host the best players in the region for the mid point of the 2013 season. Returning ATWL players were impressed with the field improvements that are continuing at Hyper Sportz. "We are making improvements to the playability of the field for the ATWL." said Field Manager Jim Bent. "We are getting great feedback from the players and will make more improvements for next season."